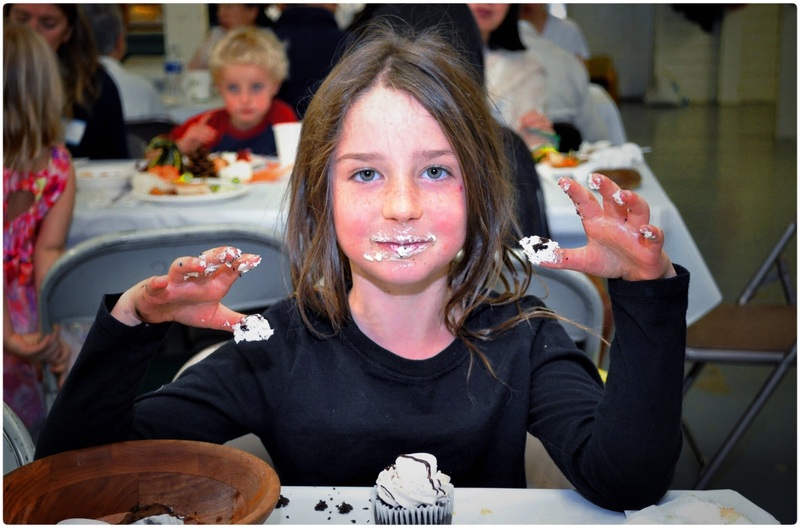 Join us Saturday, September 15 for a half-day meditation retreat and Sunday, September 16 for the Pah Bah potluck, celebration and kids program. Ajahn Karunadhammo, Ajahn Sek and several other monks from Abhayagiri Monastery will join Ajahn Sudanto for the weekend. This is a free, family oriented event. All are welcome! Location: Mtn. View Grange, 1085 N Main Avenue, White Salmon, WA. Pah Bahs are initiated by members of the lay community to offer support to a monastery. Sanghata, the board of stewards for the Hermitage, helps organize the event. Everyone is welcome. It’s free. Donations are welcome, but not required. Come for any or all of the activities. Click here to see a three-minute slide show of a past Pah Bah! Your Generosity Will Help Build an Abbot’s Kuti — Donations received for this year’s Pah Bah will help the Hermitage build a dedicated Abbot’s kuti (meditation hut). The new kuti will be in a more secluded location and will incorporate a year-around walking path that is protected from inclement weather. Any donations beyond what is needed for the abbot’s kuti will be held in reserve for future projects. Join Ajahn Sudanto, Ajahn Karunadhammo and Ajahn Sek for sitting and walking meditation, and Dhamma reflections. Chairs will be available, but please bring your own cushions if you want to sit on the floor. If you’d like to offer food to the monks while they are on alms round, they will be downtown on E. Jewett Blvd. at about 8:30 AM, then will walk north on N. Main Ave., arriving at the Grange about 9:15 AM. All food will put on the meal offering table. Please arrive no later than 10:30 AM, if you’re bringing a dish, and please bring your food ready to serve, in your own serving bowl/plate, with your own serving utensil. The meal will be offered to the monks at about 11:00 AM. Please plan to take home any leftovers. 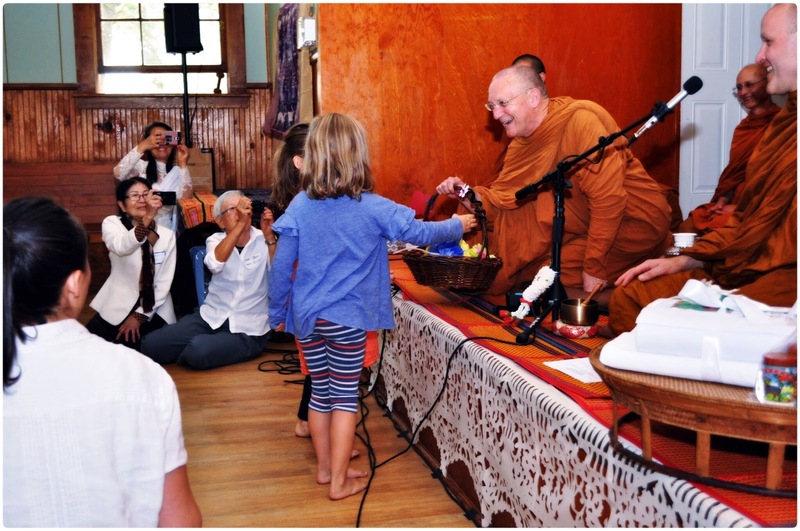 Children’s program, offering of robe cloth and material goods, some chanting, and reflections offered by senior monks. No meditation. Other languages may be spoken, but English will be the predominant language. You are free to come and go as you please. Chairs will be available. Please bring your own cushion if you want to sit on the floor. A Pah Bah is a traditional Thai ceremony, originally to offer cloth for monks’ robes. In modern times, it has also become a gathering of friends (old and new!) for a potluck meal and offering needed material goods and monetary donations. Volunteers appreciated — Help would be appreciated for setting up and taking down chairs, tables, tents, etc. at these times: Sat. 9:00 AM – noon, Sun. 9:00 – 10:30 AM, and Sun. 3:30 – 5:00 PM. Contact pahbah@sanghata.net if you’d like to help or have additional questions. Support comes in many shapes and sizes — offering alms food or meals, material goods, transportation, gardening skills, etc. Visit the Pacific Hermitage Support page for more information. See below and visit Sanghata for information on offering monetary support. Financial offerings are welcome and necessary — The Hermitage is funded entirely by donations. Since Thai Forest Traditions monks are not allowed to receive or handle money, donations and all financial matters are entrusted to a lay board of stewards. For the Pacific Hermitage, that board is Sanghata. 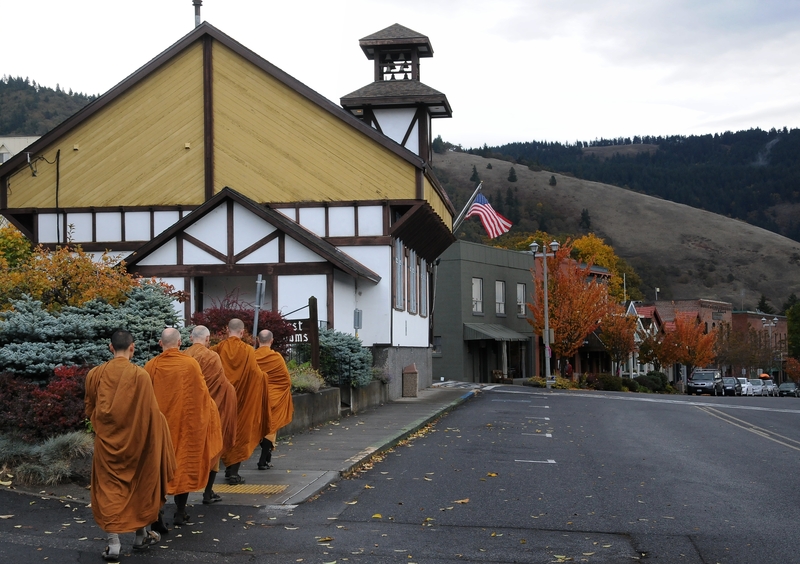 They help you support the monks so the monks can focus on practice, study and offering teachings. 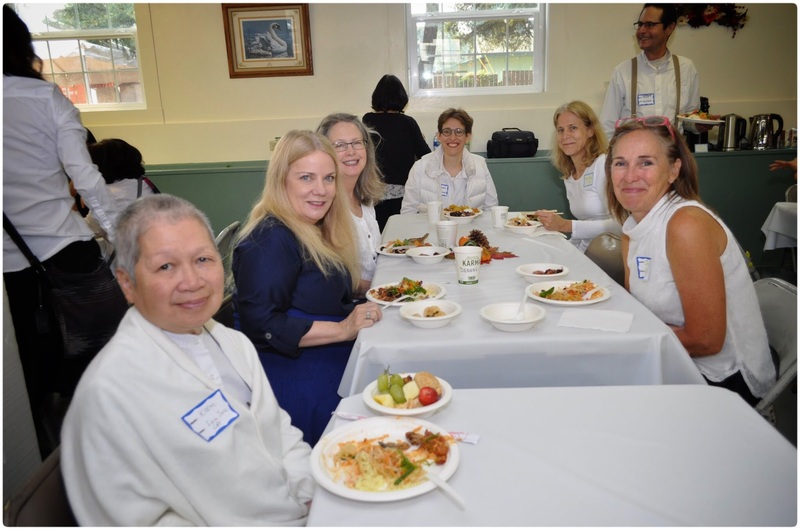 For information about Sanghata, Hermitage finances, or different methods of offering donations, please visit the Sanghata website, send an email, or stop by the dana (donation) table at the Pah Bah. Regular monthly offerings, small or large, are especially helpful for Hermitage planning and budgeting. Dana list (needed items) — To offer material goods, check out the dana list, or email us for information. Please do not offer the items listed as “Not needed.” There is little storage space at the Hermitage, so excess quantities are given away. Gift cards are a helpful alternative. Hermitage stewards use them to buy items when they are needed. Amazon, Home Depot or Ace Hardware cards are most useful. Click on the map below for a clearer picture. – Downstairs entrance (for meal offering) is from Estes Ave.
– Upstairs entrance (for retreat and Pah Bah) from Main Ave. 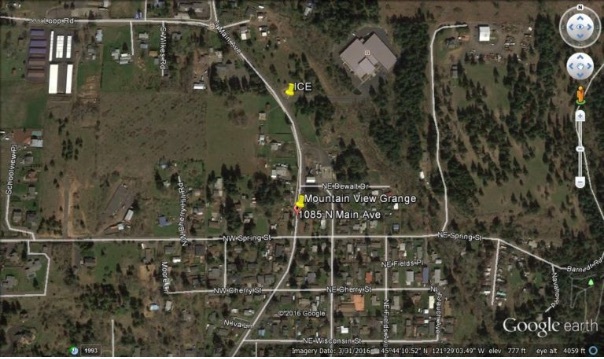 Extra Parking at ICE: If there’s no parking at the Grange, you can park at ICE, 1265 N Main Ave, White Salmon, WA 98672. This company is located a couple of blocks north of the Grange. Please: NO SMOKING anywhere on their property.